I’ve taken on the big job of making a Steamed Christmas Pudding for our family this year (no pressure really!!) and to say I’m a bit nervous is an understatement! 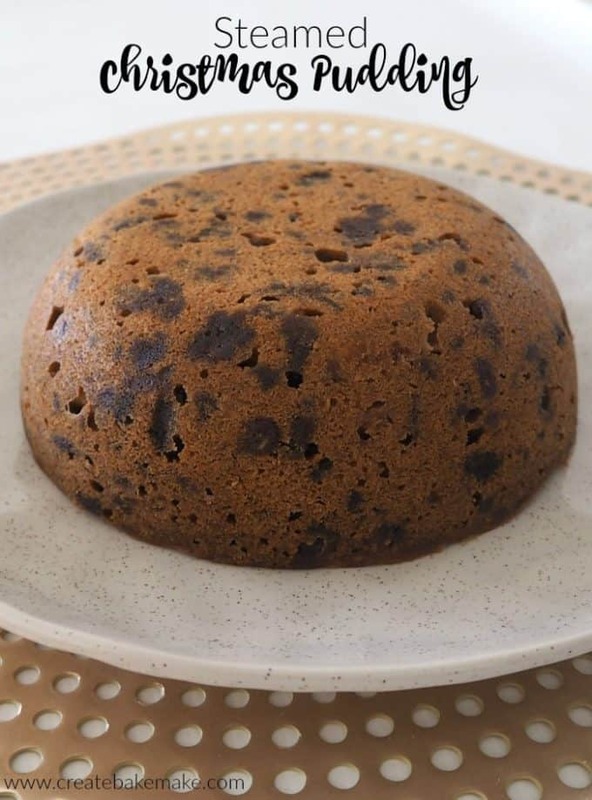 Thankfully I’ve made this easy Christmas Pudding recipe a couple of times now (even though I don’t actually eat it!) and I’ve been assured that it does taste great. I made this Christmas Pudding a few weeks ago now, so that it’s one less thing that I need to worry about in the lead up to Christmas, the only thing I have to do now is remember to pack it before we start the 18 hour trip to Victoria to spend Christmas with my family – 18 hours in the car with the three boys is going to be VERY interesting! If you can, try and let the fruit soak in the sherry (or orange juice) for at least 24 hours, however in a pinch, you can get away with letting it soak for a just a few hours, especially if you are making it in advance. To store this Christmas Pudding, I wrap it up in a layer of fresh baking paper and foil and store it in the fridge. It’s also freezer friendly too if you wanted to put half away to eat in a few months time. 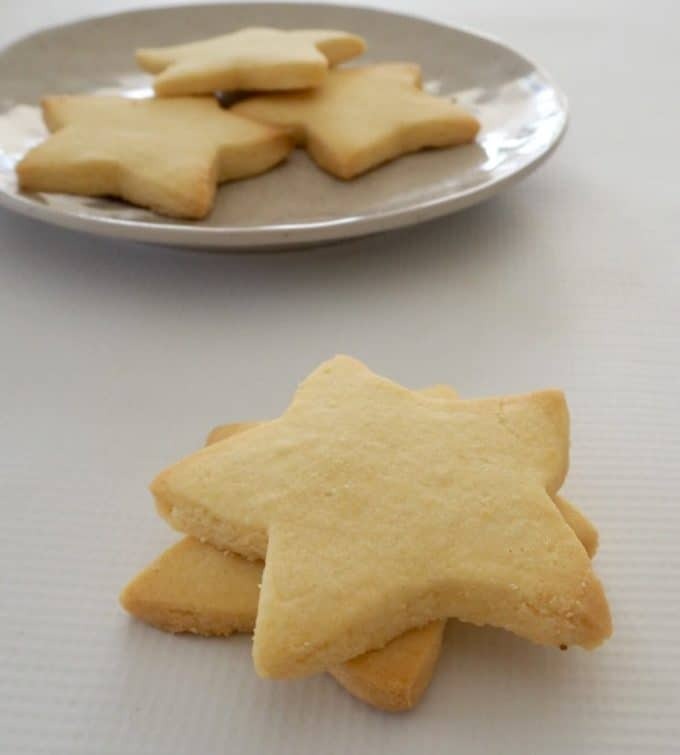 If you are looking for some more simple classic Christmas Recipes, make sure you check out my Easy Christmas Cake and my Mum’s Shortbread recipe – Thermomix instructions are included with both. 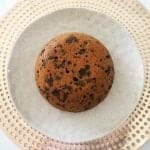 This easy Steamed Christmas Pudding can be made in advance, is freezer friendly and Thermomix instructions also included. A day in advance (or a couple of hours before if in a hurry) place the mixed fruit, chopped blanched almonds and sherry into an airtight container. Gently shake the container to mix the sherry through and set aside until needed. Place the slices of day old bread into a food processor and process until finely crumbed. Set aside until needed. Sift the flour and spices into a separate bowl and set aside until needed. In the bowl of an electric mixer, add the butter and brown sugar and beat for 8 minutes or until it's turned pale and creamy. Add the vanilla extract and mix through for one minute. With the beaters running at a low speed, add the flour and spice mixture gradually to the bowl, alternating with the eggs. Once all the flour and spice mix and eggs have been added and mixed together, remove the bowl from the mixer stand and add the breadcrumbs and soaked mixed fruit and stir through with a large spoon. Transfer the mixture into a 1.6L pudding tin, making sure it has been well greased. 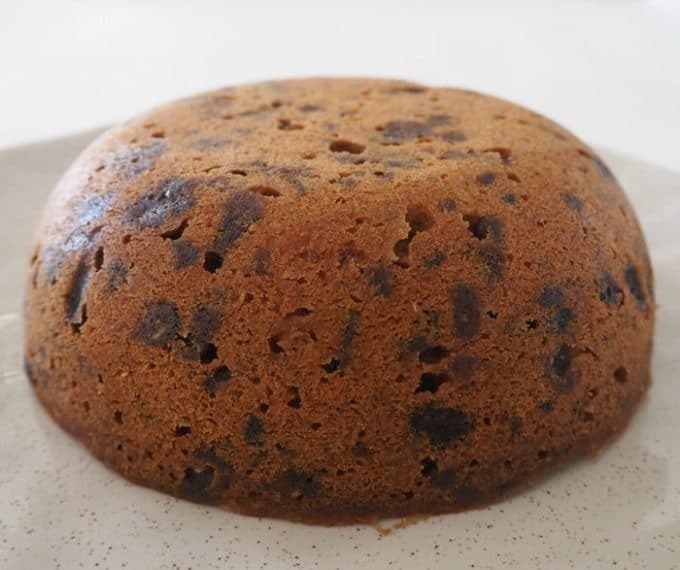 Cover the Christmas pudding mixture with a piece of baking paper which has been cut into a circle the same size as the pudding tin. Place the lid onto your pudding tin and tie two pieces of string to the sides to help you remove the pudding tin from the boiling water later. In the meantime, place an old plate at the bottom of a LARGE pot of water and bring it to the boil on your stovetop. Use the two pieces of string to carefully lower the pudding into the boiling water (the water level should come halfway up the side of the pudding tin) and place it on the plate. Cover the pot and allow the pudding to steam for 3 hours - you will need to add extra boiling water to the pot as it steams. 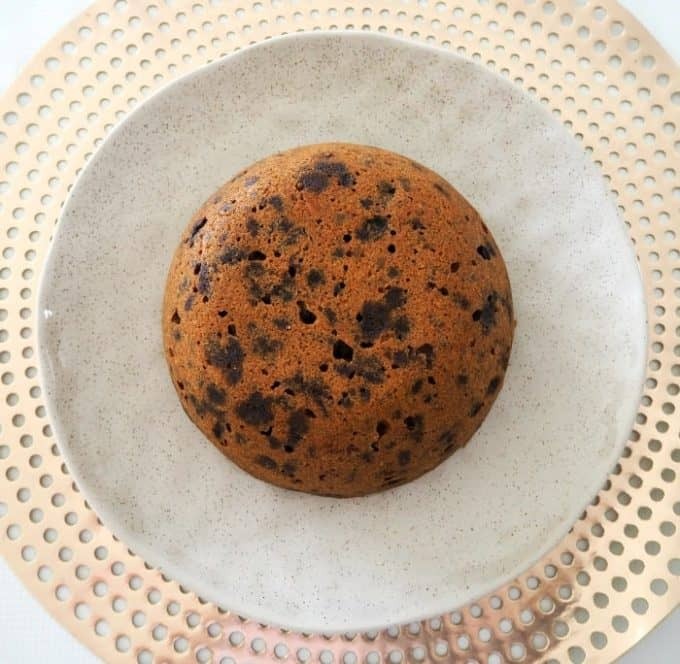 Wrap this Steamed Christmas Pudding in foil and store in the fridge. While it's best to let the fruit and almonds soak in the sherry for a day or two, you can prepare this mixture a couple of hours in advance - especially if you are making your pudding to eat another time. Please make sure you check if your pudding tin will fit into your Varoma before you start this recipe. Place approximately 3 pieces of day old bread which has been roughly torn into your Thermomix bowl and blitz for 10 seconds, speed 7 to turn into breadcrumbs. Set aside until needed. Place the butterfly into your Thermomix bowl and add the butter, brown sugar and vanilla extract. Mix for 20 seconds on speed 3. Scrape down the sides of the bowl and mix again for 20 seconds speed 3. Remove the butterfly and add the flour, mixed spice, cinnamon and ginger and mix for 10 secs, speed 4. Scrape down the sides of the bowl and add the eggs and breadcrumbs and mix for 10 seconds speed 4. Add the soaked fruit and almonds and mix 20 seconds, speed 3, REVERSE to combine. Place the pudding steamer in the bottom of varoma basket. Add 1700g of water to a clean Thermomix bowl and cook for 60 minutes, varoma temp, sp 1.5. Add more water to bowl if needed (please be careful when removing the varoma from your Thermomix) and cook for a further 60 mins at the same temp/speed. Add more water again and cook another 60mins same temp/speed, check your pudding and if the colour still isn’t even and it’s not cooked through, add some extra water to bowl if needed and cook for a further 30 mins var temp, sp 1.5. Once cooked, allow your pudding to cool in the tin before wrapping in a layer of baking paper and foil and storing in a dark, cool place until needed. 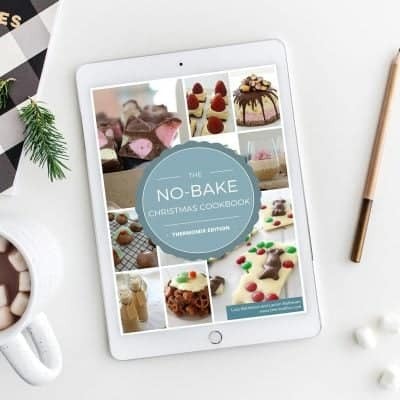 You can also find more great Christmas recipes in our NO BAKE Christmas Recipe eBook – also available in a Thermomix version. You can shop the entire range of eBooks here.